A couple of years ago, I tried this recipe to use up a glut of plums. It was lovely, but very very sweet. So, this year again faced with a punnet of fruit needing used, I decided to make a few changes: less honey, some garlic and chilli flakes – you can see my version here, and I declare it a success! This is one of those recipes that is highly customisable – more honey/maple syrup if you want it closer to the original; more chilli or ginger if you like it spicier. It’s also a one-pot thing (not including accompaniments – I suggest rice and whatever veg you fancy) that’s very easy to make for one (even though I’ve given the ingredients for 2 portions). I haven’t tried freezing or reheating this; I’d rather eat it fresh. One of my frequent dinners is stir fry: quicky, easy, healthy. I’m also of the opinion that not every meal has to be from a recipe, and the busy cook shouldn’t have to feel guilty about taking shortcuts – like buying a sauce. That said, every bought sauce can be improved a little…! I’m currently partial to the Blue Dragon sachets (esp. sweet chilli or teryaki) and then jazz it up with a little extra garlic and ginger, and maybe soy sauce. The base of my stir fries is veg: lots and lots of vegetables! It’s not a stir fry to me without carrots, onion, peppers, mange tout, and then maybe some broccoli or pak choi or bean sprouts. Bean sprouts are rare: they only come in such huge bags that a single person would struggle to get through! Once in a very blue moon, I’ve been known to buy a pre-prepared pack of stir fry veg. These are for those ultra-lazy moments, or when I’m craving a bit of a shake up. I love the ones that come with sliced water chestnuts – for the crunch! – or bamboo shoots. I used to buy tins of these things, but again they can be difficult to get through for one. 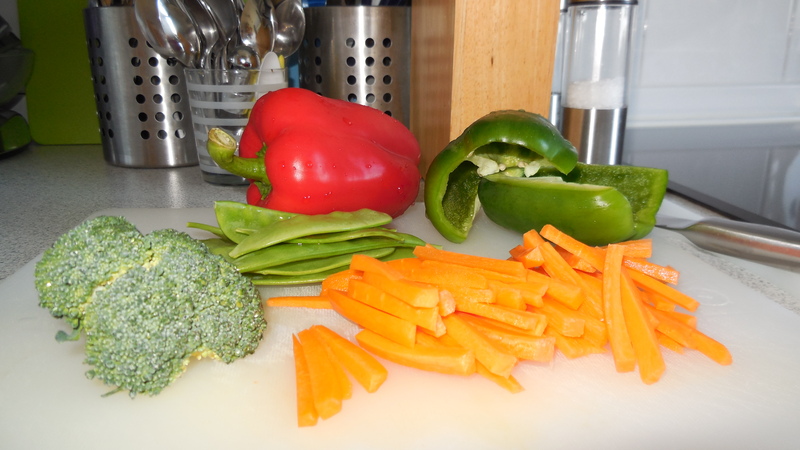 Even if you’re preparing your own veg – and I find chopping vegetables quite meditative (call me odd, but it’s calming!) – do yourself a favour and do at least two portions. This means you get a prep-free meal in a day or two, and lets you split things like peppers and carrots between two meals. For the protein, I use either diced chicken breast (I pre-dice it, and freeze in individual portions), sliced minute steak (the really thin kind), or tofu – the Cauldron marinated tofu is excellent. I also like to throw in a small handful of raw cashew nuts towards the end. 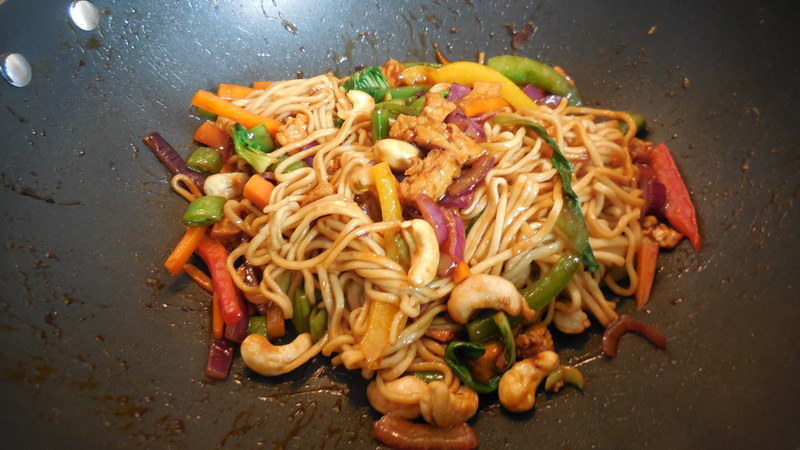 So, today’s stir fry adventure went like this: first heat a little oil in a wok – big wok! – and cook the chicken until starting to colour. Then add the onion for a few minutes – it needs a little extra, I find – along with some garlic puree. I then added the rest of the sliced veg and some ground ginger or puree, letting it all fry for a few minutes before adding half a sachet of Blue Dragon teryaki sauce – the other half keeps well in the freezer, fyi. Finally a scattering of cashew nuts before serving, with rice or noodles. Total time: 10 minutes (not including the rice)! spice up the sauce with a little extra garlic, ginger, soy, chilli flakes, lime juice, or even a splash of sherry – and these are just a few of the possibilities! serve with rice or noodles – the latter make the whole dish take about 10 minutes to cook. Let me know in the comments – what do YOU do with a stir fry? Spring is here, and it’s past time I added some more main courses to this site – not to mention dispelling the myth that I’m vegetarian! Most of my recipes fall into the ‘batch cooking’ category – single portions can seem like too much effort. This one, however, isn’t really freezable BUT it does make great leftovers for the next day! Today I’ll have this mexican-ish-inspired spicy tomato chicken with rice, then tomorrow’s lunch will be the other portion served in a wrap. That said, it’s still not the least-effort cooking preparation (cooking: easy as it gets! ): in particular, peeling tomatoes can be a bit of a pain. I would totally recommend the effort over using tinned tomatoes, though – the flavour difference is very noticable. See the ‘Top Tip’ on the recipe page for how to make the process much easier! Another time saving tip is to make this up the night before, and leave it in the fridge marinating. Alternatively, the sauce ‘paste’ will last in a small tub for a couple of days, ready for you to add the chicken and vegetables.